According to the latest department of commerce release of business statistics, women comprise over 80% of newly established businesses in the USA today. Your businesswomen readers will appreciate your mentioning Grow Yourself Rich and we will appreciate any mention you give us. In efforts to save trees we are very happy to forward review copies via email. Most business owners believe buying expensive broadcast or print advertisements are the only way to promote their business. 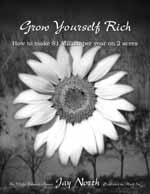 The new book, Grow Yourself Rich, by 30-year marketing veteran Jay North, teaches valuable public relations and marketing tools for inexpensive multimedia advertising options and other tools of the trade. Jay North began his marketing career by procuring over $6 million in sales in the beauty salon business. He and his (now deceased) wife, Pamela, went on to earn millions more on a 2-acre farm they called Paradise Farms. They were the first to delve into the now-popular organic farming business and were the first to offer many herbs and edible flowers to the international marketplace. They became world-famous as the Edible Flower Children, appearing on the Today Show, the Tonight Show and in many newspapers and magazines, such as the New Yorker, Newsweek, and People. All this success happened because Jay learned how to promote their endeavors. Jay has also worked in the music promotions business, as well as with charities and non-profits such as Project Bluebird and with the Blackfeet Indian Tribe. 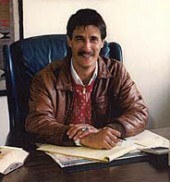 His knowledge doesn’t come from a marketing theory or textbooks, but over 30 years of real-life experience. His ideas and insight can help anyone in business for themselves. “My number one true desire is to help businesswomen/men succeed in business, if my book does that then I will have succeeded,” said Jay. It is a breath of fresh air for the business owner struggling through a slumping economy that someone really cares about your survival and prosperity. 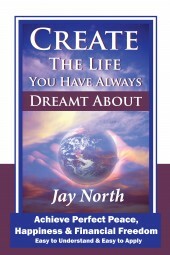 Learn Jay’s secrets compiled from after 30 years in marketing. Free Publicity? That’s just one of the secrets Jay reveals in Grow Yourself Rich. Use this book to market your organic produce… Or anything else you choose! Download Grow Yourself Rich today!